A video plays fine and properly when played directly in originating video sharing and hosting sites YouTube, MetaCafe, Google Video, CNet Videos, DailyMotion, iFilm, and Revver themselves, complete with the sound heard nicely. However, the audio is lost and no sound is heard when the Flash video is played on another third party or external sites or blogs that embedded these YouTube and other sites’ videos, although the video still moving. The symptom happens when users computers is using Flash 8 or 9, and uninstalling and reinstalling Adobe Flash Player won’t help. Here is a simple solution to fix the problem that embedded flash video from YouTube, Google Video, Daily Motion, Revver, iFilm and Metacafe on third party websites or blogs failed to play sound and audio. Visit a web page with a Flash video embedded on the page. Click on the Flash video to activate the Flash plugin (only on Flash plugin installed Windows XP SP2 or newer), then right click on video to display the Flash properties menu. Click on Settings on contextual menu, then click the Advanced… button. A new web page window will launch loading Adobe – Flash Player – Manager. 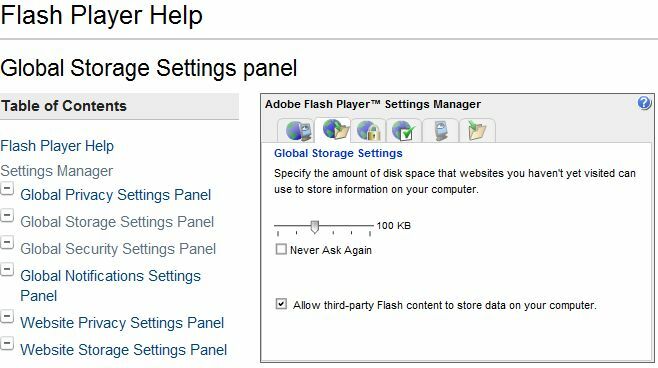 On the left pane, click on Global Storage Settings Panel link under “Flash Player Help Settings Manager” sub-section under “Table of Contents” section. A Adobe Flash Player Settings Manager applet will load on the right pane as a Flash object. Select (tick) the Allow third-party Flash content to store data on your computer checkbox so that it’s checked. The settings should be auto-save, if the setting is not saved, try to close all Internet Explorer or Firefox web browser windows and launch the Flash Manager to set the option again. Try to play Flash video. The sound should be played properly. If the above guide does not solve the problem that video clips from YouTube, VideoSift, Break, Google Videos, Dailymotion, Yahoo, and other video sharing websites play no sound on external sites while audio output fine when viewing the video on video hosting sites itself. Another possible cause is that the Flash contents which is cached get corrupted or damaged, preventing audio streaming from working correctly (Most video sharing sites use Flash video technology to deliver video and audio streaming). To solve this possible corruption, try to use the following hack. Download and install CCleaner, a freeware system optimization and privacy tool that able to remove unused files from system, and clean traces of online activities. Run CCcleaner, uncheck and unselect everything that is selected in both Windows and Applications tabs for Cleaner function, except the option of Macromedia Flash Player, located under “Multimedia” branch in “Applications” tab. Ensure that all other options are unselected, or else there may be unforeseen sequences including unable to boot your computer. Click on Analyze button, and when finished, click on Run Cleaner button when done. This will clean and clear out the old downloaded Flash caches. Try to load the embedded videos again, the sound should output fine now.